The former world number one only dropped three games en route to her first round victory. Serena Williams extended her winning run in Cincinnati to 11 matches after defeating Daria Gavrilova 6-1, 6-2. The American won in 2014 and 2015 but did not play the last major warm-up before the US Open the last two years due to injury and pregnancy. Serena looked quite sharp, moving well and really dictating play with the forehand. Her second round opponent will not be anything like Gavrilova though as Petra Kvitova awaits. Serena came out firing, getting the early break of serve. Her groundstrokes looked crisp after the week off with her forehand especially firing. A forehand return winner clinched the opening break. A few unforced errors from the former world number one allowed Gavrilova to get on the board, but Serena looked fit and firing, moving magnificently up 40-15 as she capped off the game with a forehand winner for 4-1. 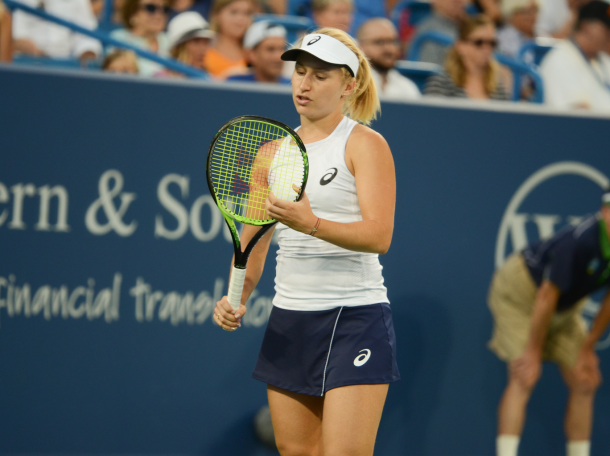 Gavrilova had chances to put pressure on Serena by trying to hold for 4-2, but much like her first break, the 23-time Grand Slam champion fought back and used that forehand once again to capture the break. It was a convincing 6-1 opening set to the American. The American picked up right where she left off immediately in the second, finding herself with three break opportunities in the third game. An errant backhand from Gavrilova gave the break. The seventh game proved to be crucial with both players having opportunities to take the game. Gavrilova crucially saved one break point after her drop shot brought Serena into the net then hit a magnificent backhand pass which had the American applauding. Despite that, a double-fault gave a second break to Serena which prompted a frustrated reaction from the Australian. An unreturnable serve called it a match as Serena looked vintage in this performance, a much better look compared to her match against Johanna Konta in San Jose.